Speed and velocity are the same thing aren’t they? Even if they are technically different, it only mattered on your high school physics exam and not in the real world, right? The Preliminaries --- Where’d that Kid Go? Start with an athlete standing in the middle of the floor exercise mat. Then tell him to move 10 feet. When he’s done, where is he? With no more information than he moved a distance of 10 feet, you really can’t know. You know he’s not more than 10 feet from where he started, but he could be anywhere within a circle with a radius of 10 feet (figure 1). Distance is a measurement known as a “scaler”; a value with no direction. In each case in figure 1, your athlete has moved 10 feet, but in no particular direction. Displacement, on the other hand, has both size and direction. Again, place your in the middle of the floor exercise mat, but this time have him move 10 feet east. When he’s done, you’ll know exactly where he is. He’s move from point 1 to point 2 (figure 2). ﻿﻿ This difference between distance and displacement will carry through all gymnastics physics. Speed and velocity carry over directly from distance and displacement. Speed is the distance traveled over time elapsed. 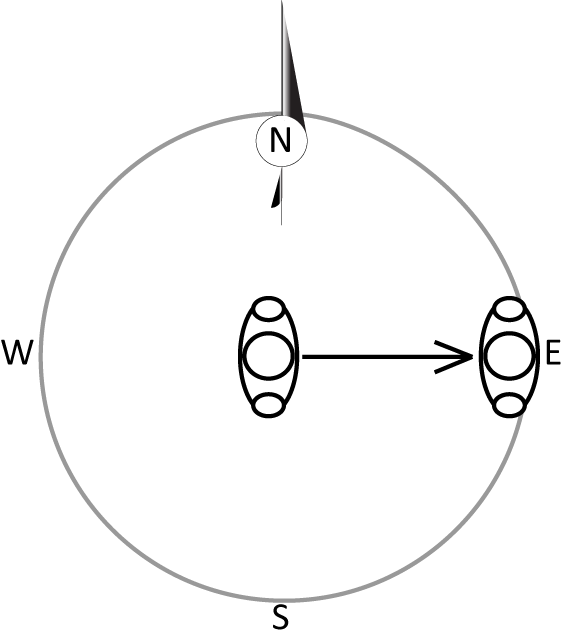 Velocity is the change in displacement over time elapsed. Locate an athlete at the beginning of the vaulting runway (figure 3, #1). Then tell him to run at a speed of 12 feet (ft) per second (s). After five seconds, where is the athlete? You’d know he has run 60 feet and you might expect that after five seconds he is on the vaulting board. But, you just don’t know …. Speed is a scaler, again, a value with no direction. So, your athlete may have run straight down the runway, but you didn’t tell him to do so. He could have turned and run out the door and down to the park and still have met your instructions (figure 3, #2). Twenty minutes later, when you’ve finally located the kid, put him back at the end of the runway. Then tell him to run at a speed of 12 feet (ft) per second (s) toward the vaulting table. This time you know exactly where he is after five seconds; he’s on the vaulting board. 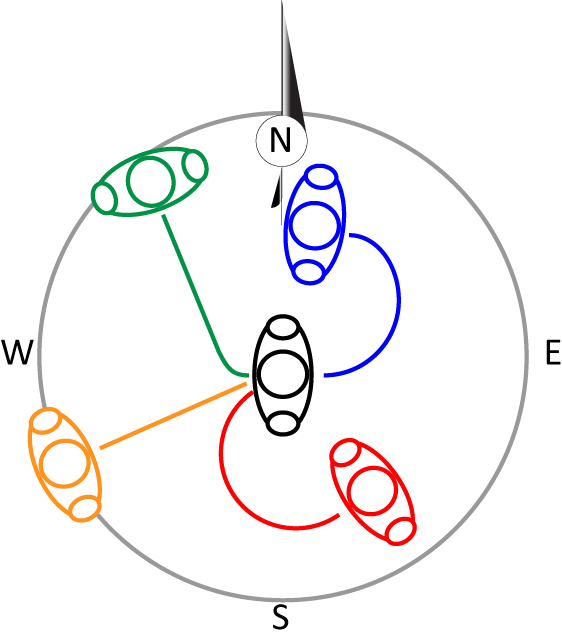 You know that because you gave him not just a speed to run at, but also a direction (figure 4, #2). Gymnastics technique is largely is governed, not only by how fast you can move, but in what direction you move. An athlete who sets a backward salto on floor exercise can set it upward or backward or anywhere in between. Merely evaluating the speed of the set in insufficient. You (and he) need to know in what direction the salto is set (figure 5).A hard set backward is as much of a disaster as a soft set. A hard set upward will give the athlete at least sufficient height. A hard set backward will turn a layout into a whip-back. So, direction is critical. Velocity is defined, not merely as movement over time, but as movement over time in a direction. This is of course just a beginning, but a critical beginning. If your athlete can move fast, but not in the right direction, if hardly matters.